Hey everyone! Today, we have a blogpost that’s on something that I don’t usually talk about, but was requested by people on Twitter, so blame them if it’s not up your alley, or if you didn’t come to the internet to talk about periods XD. Today, I’m telling y’all about menstrual cups! We’re going to start with talking about my experience, then going to the tips that I have since starting to use it, a list of pros and cons, and then finally, about my specific cup! My journey with a menstrual cup started when I watched this video by a small YouTuber called Kristina Hailey about a year ago. I didn’t actually get around to purchasing and using one until around 3 months ago, but I was interested in it for a while before I actually started using it! I’m not really a squeamish person, and I don’t mind talking about period things, so I essentially live-tweeted my first period while using a cup (which you can find here if you want). At the end of it, I put out a poll asking if people wanted to see a blogpost about my experience, and the answer was yes, so here we are! So to start off, if you don’t know what a cup even is, it’s a small silicone cup you shove “up there” during that time of the month, and it collects . . . what comes out! There’s one in the thumbnail, in the upper middle). You can use it in place of pads, tampons, and anything other “supplies” and it’s a lot better in a lot of ways (which I’ll get into later). I’ve been using one for three months now, and while that doesn’t count as /a lot/ of experience, I wanted to share my tips that I’ve gotten from it so far! Plan to stay at home the first day, or at least the first few hours. Even though a cup can hold more than a pad or tampon, and doesn’t need to be changed as often, the first few times I put it in, I didn’t do it quite right, so being at home with a change of clothes and within arm’s reach of a private bathroom helped a lot! Once you get the hang of it, it allows for so much more freedom, but for the first few hours, being able to drop everything and fix it is crucial. Feel around “up there” first. The cup essentially goes around the base of your cervix, and it’s hard to get it there if you don’t know where it is!! Before your first insert, put a finger up there and make sure you know what you’re aiming for. (The cervix is up higher when you’re not on your period, which is why I’m recommending you do it ON your period: I can’t feel mine when I’m not on my period, so don’t freak out if you just can’t find it). Wear a liner! Since I’m still pretty new to the cup, I’m still not able to tell stuff like when it’s getting full or when it’s not suctioned properly, so I’d recommend wearing a liner in case it overflows or if you didn’t put it in right! It tilts back further than you think! I don’t wear tampons often, but it’s similar to how you put in a tampon at an angle pointing towards your tailbone, except more! Keeping that in mind is REALLY important to make sure you’re putting it in correctly! These are just some tips I’ve found to be extra important to remember, and if you want to find more information, there’s plENTY elsewhere on the Internet! It’s cheaper! A cup is about a $20 investment–about the same amount as a month’s worth of supplies–and lasts for up to 10 years!! It’s better for the environment! Pads, tampons, and the like are creating SO MUCH plastic/biohazardous waste, and with cups, there’s literally like 99% less! There’s no chance for TSS! Unlike tampons, the blood isn’t actually touching any of the walls inside of you, so there is no chance for TSS-causing bacteria to get to you! Because of that, you CAN sleep with it in! It’s better for you! A cup is made up of silicone, so there’s no scents, dyes, bleaches, etc! In addition, it doesn’t interfere with your body’s natural processes, unlike a tampon would. It doesn’t smell! Since the blood stays inside of you until you take it out, it doesn’t smell, unlike a pad! It’s cleaner! Unlike pads and tampons, the blood from your period is being collected, rather than absorbed, so it’s cleaner! It also FEELS a lot cleaner, especially since I usually only use pads, and YOU’RE NOT SITTING IN YOUR OWN BLOOD, and you can do everything that you normally do (except squats at the gym. don’t do those. those get bloody. trust me), and it’s so much cleaner! You get to know your “down there” and your cycle better! Since I’ve started using a cup, I get to ACTUALLY SEE how much blood I’m producing, and it’s helped me get to know my cycle a lot better! Also, I’m a lot more comfortable with the anatomy “down there” since I have to stick my fingers up it often! It’s easier! I’ve found that a cup lasts longer for me than a maxi-pad or tampon, AND it doesn’t show through pants (like a pad would), AND you don’t need to remember to keep bringing supplies with you, AND, unless your flow is exceptionally heavy, you don’t have to change it during the day if you’re out for less than 8, or even 12 hours! The cup I use is the blue Dutchess cup (which was the cheapest cup I could find on Amazon hahaha), but a lot of people like the Diva cup. And that’s all the wisdom I have to impart on the using of menstrual cups (at least, so far)! Do you use a cup? Are you thinking of starting to use a cup? Are there any other things about a cup you want to see from me? Let me know down below! In a thrilling new fantasy from the bestselling author of the Storm Siren Trilogy, one girl makes a stand against society and enters a world made exclusively for boys. Every year for the past fifty-four years, the residents of Pinsbury Port have received a mysterious letter inviting all eligible-aged boys to compete for an esteemed scholarship to the all-male Stemwick University. The poorer residents look to see if their names are on the list. The wealthier look to see how likely their sons are to survive. And Rhen Tellur opens it to see if she can derive which substances the ink and parchment are created from, using her father’s microscope. In the province of Caldon, where women train in wifely duties and men pursue collegiate education, sixteen-year-old Rhen Tellur wants nothing more than to become a scientist. As the poor of her seaside town fall prey to a deadly disease, she and her father work desperately to find a cure. But when her mum succumbs to it as well? Rhen decides to take the future into her own hands—through the annual all-male scholarship competition. With her cousin, Seleni, by her side, the girls don disguises and enter Mr. Holm’s labyrinth, to best the boys and claim the scholarship prize. Except not everyone is ready for a girl who doesn’t know her place. And not everyone survives the deadly maze. Like most of the book reviews I write, this book is by an author I’ve been wanting to read for FOREVER and just haven’t gotten around to yet! 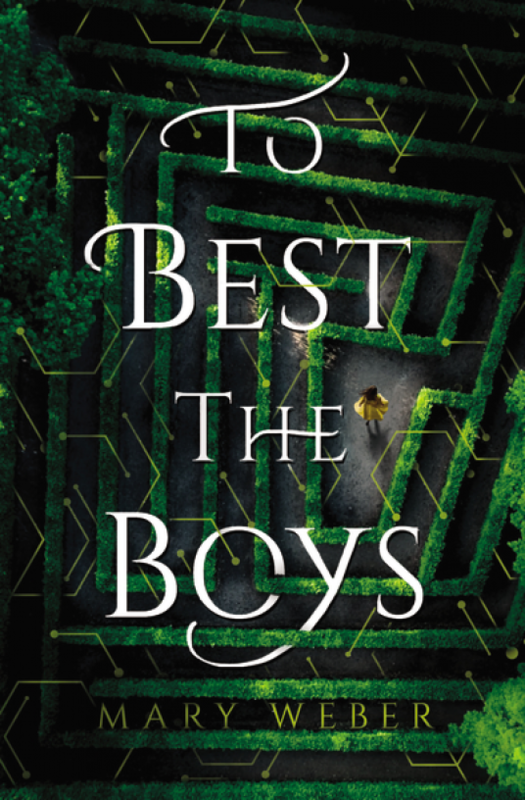 As the release date for To Best the Boys is coming up, I figured I’d give it a shot, and EEEEEEE the hype for Mary Weber did not disappoint! The people who said that this book was like a combination of Caravel and The Scorpio Races were spot-on: it was a The Scorpio Races setting (especially the mostly realistic, but with ~special~ creatures bit), with the labyrinth bit being a lot like Caravel. And since I loved both those books, it stands to reason that I loved this one too! Her cousin Seleni was another important character in the story: she was also brave and daring but she /liked/ frills and dresses and /wanted/ to have babies and DIDN’T want to go to uni, and the story made the distinction that both of them were OKAY! And the boys!!! Lute and Beryll (but mostly Lute, of course) were such great gentlemen, and Lute IS JUST PRECIOUS, okay?? Also Vincent is a literal piece of garbage #ooF. I really really enjoyed how the relationships were already there, so it wasn’t like “oh, they met in the maze and now they’re kissing” it’s more like “oh, we’ve liked each other foREVER and like OOPS WE KISSED” and if you’ve ever read any of my reviews, you’ll know that I LOVE THAT!!! Another thing I really liked about this book was the distinction between the upper-class and the lower-class. The people putting in regulations, and the politicians (a big @ VINCENT), and the fishermen, who are just tRYING THEIR HARDEST to live and make a living. The disability rep was also so, so good in this book! I did not expect a book that seemed to be set in the 19th/20th (ish) century, to speak about disability (namely, autism, down syndrome, dyslexia) so kindly, and so well, and I loved that! -and the other characters: Lute, Beryll, Rhen’s dad, Mr. Holm!! -It was such a cool setting!! looking at it holistically it really doesn’t make sense, but it was described so well that it worked! -also that writing style was so smooth and clear and beautiful I LOVED IT!! -some of the endings seemed to tie up too nicely? Thank you to the publisher, Thomas Nelson, for providing me with a complimentary e-copy of this book via NetGalley in exchange for my honest review; I was not required to write a positive review. Hey guys! Today I have a blogpost that I’m really excited about*! You got to follow me around a day in my life as a college student! My mornings usually start off pretty slowly: this semester, my classes don’t start until 11am, which is reaaaaaally nice. I like to try to be out the door by 9, though, so that I can get some study time in before class. Before I leave, I wake up, get ready for the day, make some coffee, and make my bed. Then, I usually go do work while eating breakfast in the diner. Sometimes, I’m lazy and go back to my room after eating breakfast and do work there, though I get decidedly less done when I’m in my room. I like to sit in the diner for a couple hours, and (hopefully) get some work done, then I head to class! I have between two to five hours of class a day, depending on the day. They’re usually split up in two blocks: one in the morning or early afternoon, and then one in the evening. Some days, I also have orchestra, which is always really fun! Walking to class takes anywhere from five to twenty minutes, and I put on some music or a podcast to listen to. (I’m looking for podcast recommendations btw: let me know your favorites!). Sometimes I have classes with my friends, which is always really fun! After my first block of classes, ending by 1pm or 3pm, depending on the day, I go back to my dorm to eat lunch and to relax a little bit before my evening classes. This is when I usually do my Bible reading, journal (if I’m feeling extra motivated) clean my room, and take a shower as well (the showers are a lot less crowded in the afternoon than they are in the morning). My roommate is usually out so I get the room to myself then. If I have some spare time, I find some friends and study/hang out with them. Some days I don’t go back to my dorm, and instead find a quiet corner to study. After my evening class, I usually eat dinner and hang out with friends. I also do my homework due that night or the next day. I got lucky this semester: if I budget my time right, I only have one assignment to do every night. If I have an exam the next day, I study for them as well. If I have any spare time, I read a book or work on blogging. My roommate and I usually open up our room for a sort of study hall/hang out spot after dinner, so it’s always a fun time hanging out and studying together with our friends. Sometimes–usually on the weekends–we watch a movie after everyone is done with their work. So there you have it! A day in my life as a college (!!!) student! It’s really not as interesting as I hoped it’d be, but I hope it gives you a look into what my life as a college student looks like! What does a day in YOUR life look like? Are you in college, in high school, or out of school? What is your favorite podcast? Let me know in the comments! Hey guys! Today, I’m here with a super exciting post: a blog tour post! And not just any blog tour, it’s a blog tour for Fire Starter, which is a program that helps you launch your blog! I was able to beta test some of the program, and I learned so much from it, even after blogging for four years! Fire Starter was created by Livy Lynn and today, she’s here to talk about how to create your blogging business plan! Take it away, Livy! Did you know there’s a vast variety of ways you can earn income from one your favorite hobbies: blogging? Devote the rest of your life to mastering the algorithms of Pinterest! And while learning that you you might have to spend the rest of your life on Pinterest isn’t necessarily a bad thing (can’t get enough of those cute puppies and stellar shoes! Hehehe) there is a better way to do it. The truth is, you can develop a plan to slowly start earning income on your blog even if you’re not a full time blogger. And that’s exactly what we’re going to talk about in this post! Creating your Blogging Business Plan! One of the dangers in attempting copy-and-paste formulas from Pinterest, is it doesn’t give you room to do you. Every blogger is different, with a vast variety of goals, dreams, and ideas of what they’d like to get in return for all their hard work. I think it’s important for each blogger to have personalized plan, something that works within their time restraints and truly helps launch them toward their goals. That’s why as much as I love writing articles about this topic my favorite thing to do is sit down, one-on-one with authors and bloggers, and ask them where they’re at right now, where they’d like to be in the future, then create a customized Game Plan, a road map to help them achieve their goals! My amazing friend Bella and I do this with our Cheerleader Sessions via Skype (we’re giving away a FREE session at the end of the post, so keep reading!) and if you’re really serious about developing a business plan for your blog, I’d highly recommend that. But, even if you never do a session with us, I’d like to give you an overview of the 7 streams of income you can potentially earn from your blog! This includes both Google adsense ads and self-hosted ads, where you sell space on your side bar, or sponsored content. One of my favorite monetization options is the Amazon Affiliate Program. As you know, Amazon.com boasts millions of products. It’s a popular, well trusted website that nearly everyone shops from! They sell books, movies, CD’s, toys, and even adorable little clothes for your puppy dog. Basically, they have something for everyone. They also have something for every website. Whether your unique niche is focused on raising the perfect puppy, Bible journaling, or Christian music reviews, you can find a way to earn some extra income with Amazon! This includes any physical products such as mugs, phone cases, pillows, and even (my personal favorite) self-published books. “What? E-books?” I hear you question, “How can someone possibly earn money off of e-books when they’re only selling for .99 cents? !” Many authors have been successful with selling e-books, but I’d like to invite you to think beyond these small price points, into something bigger. Something much, much bigger, which applies to you, even if you’re not a fiction author.Creating a non-fiction e-book chock full of valuable information which your blog readers are already craving, can be marketed and sold with huge profit margins. In today’s day and age, so much of our learning happens online. You can learn pretty much anything on the internet! Creating an online course for your blog followers is a great way to package everything you wish to share, for those who desire to dig deeper into your content, and this has very large margins as well! What is it that you’re really, really good it? Designing web pages? Editing or offering feedback on the writing of others? Creating recipes with yummy organic foods? Helping your family get organized? Painting? Interior design? Crafting? Writing songs?Your special, unique giftings are needed by the people who read your blog! The more you can zero in on ways you can offer helpful, unique, valuable services to your readers, the closer you are to earning some more income! Working with sponsored post companies, creating package deals for clients who wish to advertise with you, and brainstorming creative ways to connect businesses with your following, is all part of being an online influencer! Do any or all of the above ideas sound exciting? Are you ready to dive in and start earning income from your blog? Sounds amazingly fun, right?! Bella and I know that growing an online platform takes work and patience. But we also know that when you have a clear roadmap with consistent, daily steps, you CAN accomplish your goals and dreams! Entering for a chance to win is super simple! Just hop on over to my blog and sign up for my free email updates (and I’ll throw in a free e-book, just to say thanks!) and you’re all set! Good luck! Bella and I can’t wait to meet you and help create your Game Plan! Or, if you’re a blogger who’s looking for a pre-made Game Plan, we have that too! I’m SO excited to share my 20 Day video series for bloggers! It’s called Fire Starter: Launching a Blog that Blazes! This interactive course teaches bloggers (both old and new) how to create their dream blog or website, monetize their site, AND give them all the tools, encouragement, and support needed to be truly successful on their journey! The Fire Starter course is listed at $150.00 but we have a special code for you to get $100 off! Simply grab the coupon code on my website and add it to the cart when checking out, and you’re all set! You can check that out here! Livy Lynn is a twenty-something author, singer, and songwriter. She enjoys crafting YA fiction that is pure, lovely, inspirational, and of course, entertaining! When she’s not writing, you can usually find her playing guitar, blogging, drinking peppermint tea, connecting with new friends, planning her next trip to Disney, or pinning images of Europe and Golden Retriever Puppies! What are you waiting for? Go check out Fire Starter, to get tips and tricks like this and many more about blogging! I . . . don’t remember why I picked this book up? It was a fun read, but it’s not something that I would normally read. The Coffee House Mysteries features a chain of crimes that occur to ladies in a book club, and since the sheriff isn’t the . . . most helpful, they try to help sort things out. These stories cover what happens over the span about a year, and it was so sweet! I think my favorite story from the collection was the one featuring Jo, the oldest lady. All of the stories are very sweet and mostly clean, and are very cozy (so long as you don’t read at midnight . . . oops). The 6 who-dun-it stories in this collection are all written by different authors, but centered around the same town and same reading club: the various ladies from the club take turns being the protagonist, which I found really cool. The different writing styles gave a sort of different speaking voice to each of the ladies, and I found that really cool. One thing I would say is that it’s marketed as Christian fiction, but there really isn’t much “Christian content” in almost all of these stories, sO if that’s something you’re looking for . . . not here. Overall, it was a very sweet collection of stories! I always appreciate short stories, because it gives me a chance to set the book down in between reading it (and no, chapters don’t count). I really enjoyed reading them, and the coffeeshop treats and book club talk was SO SWEET I WANT THAT IN MY LIFE. Thank you to Barbour Publishing for providing me a complementary e-copy of this book (via NetGalley) in exchange for a honest review; I was not required to write a positive review. Hi everyone! How are your Januarys going? We are HALFWAY through January, can you believe it? I go back to college next week, so today, I’ll be telling you the BEST productivity apps that I use to keep my life together. I use all of these in a combination with my bullet journal. Some features of each app are better than others, and I don’t necessarily use ALL of them together all the time, but all them are apps I SWEAR by! These are (almost) all apps that have a mobile app, as well as an desktop counterpart, because I need apps that sync over between my phone and my computer! I mean. Of course. Google is the BEST thing out there. I use my Google Calendar much like Abbie does: I used to do calendar blocking in my bullet journal, but when I started college, so much of what I needed to use was online that I needed something that I could access both on my laptop and my phone, so I switched over to calendar blocking on Google Calendar. My Google calendar is also synced to the calendar that comes with my (android) phone as well as the calendar on Windows 10, and that’s been really helpful as well (I can never forget what I’m supposed to be doing at any given time!😅). Plus, Google also has Tasks and Keep which integrate into the calendar, and it’s AWESOME for keeping track of everything! I used Habitica wayyyy long ago in early high school, but stopped. Over winter break, I started to use it again. Habitica is a role-playing productivity app, where you getin game rewards for completing your real life tasks. The tasks are divided up into Habits (tasks where you get rewarded/penalized based on if you accomplish a task), Dailies (tasks you must complete daily in order to not dealt damage), and To Dos (which are exactly what they sound like). There is also a groups, or “guilds,” feature, which are essentially chat rooms on various topics, such as short term productivity, knitting, or gaming! I don’t use Habitica for school: I find inputting individual assignments into Habitica too tedious and ends up counterproductive, but it’s great for keeping me motivated when I don’t have school! (disregard all the overdue tasks lol those were assignments from last semester that I didn’t check off) This app literally SAVED ME everyday last semester at college! This app is SO helpful: when I got my syllabi for each semester, I inputted all the assignments, quizzes, and exams into My Study Life, and they were all there for the semester! The dashboard lists my class schedule, a list of tasks due each day, and upcoming exams, all in a sleek and easily accessible place. It also has a feature for building name and room number, AND sends you alerts right before class with them, and that was the most helpful thing ever for me not knowing where anything was yet. If you’re a college student, check this app out. It will SAVE you. I don’t usually take notes on my laptop, but when I do, I use Evernote. Evernote is the app I use specifically to keep track of my notes for class. The feature I appreciate the most about Evernote is the “Notebooks” feature, where my notes can be grouped into classes. Because it’s my designated note-taking app, I can turn off my internet/turn on airplane mode and just WORK, and it’s amazing. It’s such a simple design, but it works AMAZING. If you’re anything like me, I waste /a lot/ of time on my phone. So to combat that, I downloaded QualityTime on my phone. It shows me exactly how much time I use on each app and when, and also has a weekly overview version! It’s Quite Scary how much time I spend on my phone!!! The part that I appreciate the most is the notification that stays in my dropdown bar, so every time I swipe down to check my notifications, I get reminded of my usage being tracked, and motivates me to STOP! This goes without saying, but this is just an mobile app: there isn’t a desktop version of this, although I’m sure there’s some variant of it somewhere! So there you have it! The productivity apps I SWEAR by to get me through college, and the apps that I use to keep my life together! Do you use any of these apps? What is your swear-by app? Let me know in the comments: I’m always looking for new systems to check out! A Desperate Hope by Elizabeth Camden (Empire State #3) February 5th, 2019- I’ve only read one book by Elizabeth Camden so far, but I’ve really really enjoyed it! Her books have women who are working and are smart in a time where that wasn’t really a huge thing, and I really enjoy that, and I’m looking forward to reading this one! The Warrior Maiden by Melanie Dickerson (Hagenheim #9) February 8th, 2019- I STILL need to read the rest of this series!! I’ve been slowly plugging through this series in order, and . . . eventually I’m going to get to number 9, but when I do, I’m super excited to read this one! Mulan is going to be a GREAT retelling by Melanie Dickerson! Just For Clicks by Kara McDowell February 19th, 2019- A book about bloggers and the Internet and stuff!! I don’t actually know much about it besides that (lol), but I’m very excited to read it, it sounds like a fun read!! Within These Lines by Stephanie Morrill March 5th, 2019- I’m always down for a WWII book, and this one in particular is one that’s set in a part of WWII that’s not commonly mentioned, and I’m super looking forward to checking this out! The Boy Who Steals Houses by C. G. Drews April 4th, 2019- I’ve followed Cait’s blog, Instagram, and Twitter forEVER, and with the content she puts out there, I’m super pumped to read her new book (I haven’t actually read A Thousand Perfect Notes yet . . . but I’m hoping to get to it before this book comes out! It’s a book about a pianist and it will actually DESTROY MY SOUL). Sweet on You by Becky Wade (Bradfords Sisters Romance #3) April 30th, 2019- I’ve read the first book and the prequel to this series, but I haven’t read the second book yet. The covers are GORGEOUS though, and I’m looking forward to reading this one! Finale by Stephanie Garber (Caravel #3) May 7th, 2019- Let’s be honest, the cover of these books alone make you want to read it! I’m looking forward to seeing more of the breathtaking world of Caravel! Book 3 of the The Blood Race trilogy by K. A. Emmons ?? ?- The title, cover, and release date for this isn’t even out yet and already I’m pumped for this one. kate is just a MASTER at words and I’m so looking forward to seeing what book 3 is going to give us. Fire Storm by Nancy Mehl (Kaley Quinn Profiler #2) August 6th, 2019- AHHH I’m so pumped for this book! I love Christian suspense books, and I ABSOLUTELY LOVED the first book in this series, and I CAN’T WAIT for the next one in the series! The problem with making these yearly comprehensive lists so early on in the year is because a bunch of the books coming out later in the year aren’t even listed . . . but I guess that means I’ll have to make another one of these posts soon . . . my loss I guess🤷. Now it’s your turn! What is your most anticipated read of 2019? Are there any on this list that have now been added to your TBR pile? Let me know in the comments! Hi everybody! Welcome to a really fun post: a bullet journal post! I always love putting these posts together, but haven’t done one in over a year . . . so I figured it was high time to do another one! I’ve learned so much about bullet journaling over the year I haven’t done these posts, and I’m very excited to show you! I set up new year’s bullet journal while I was watching AmandaRachLee‘s 2019 Plan With Me video, so you’ll see that a lot of my set up is very similar to what she has. You’ll also notice that I use my Zebra Mildliners a lot for this set up: I realized that I’d gotten them last year but had never use them yet, so I decided to pull them out and give them a shot, and I LOVE them!! So to start off, this is my “welcome to 2019” page. I don’t really like to do quote pages and stuff, so it’s has 2019 on it in big numbers, then it has all of my New Year’s Resolutions for this year on it as well. Next, this is an idea directly taken from Amanda’s video, but I have a grid spacing page. This page has the boxes (rows and columns) numbered, and it also has how the page would be divided up. I’m not sure exactly how useful it will be to me, since I know pretty much how I divide up pages (especially since I’ve used this bullet journal notebook for over a year now), but it will be a handy reference to have, should I need it. Then for the first spread, I have a future log: this is the first time that I’ve actually used a future log (this log is also taken straight from her video), but it looks really good and I’m excited to see how it’s going to work! And for yearly trackers, I also have my photo a day tracker. I’m still not entirely sure how I’m going to use it, but the left side is for special events, such as hang outs with my friends. I’ll use that to track my photos for those. On the right side are 365 boxes, and I’ll check one off every time I take a photo. Up next I have my winter break to-do list. I have over a month of winter break, and I want to be as productive over that time as I can, so I have a list of 100 things I want to accomplish before I start school again. After that is my January spread! I changed it up a bit from how I had it for 2017 and 2018, but it’s still a little bit similar. In the top left corner I have my Monthly Goals, and to the right of that is a month-at-a-glance overview calendar. Below the calendar is a space to write what I did each day in the month. To the right of that is sort of a blank space? I’m using that to write down my morning routine, but I still have to figure out a morning routine that works well for me, so it’s mostly blank still. I also have my habits tracker for January! This is another idea taken from Amanda’s video, with the individual calendars for tracking. Previously, I’d only used the one page every-habit-is-a-row kind of tracker and this one looked like a fun (and cute!) one for a change. I’m not sure if I want to continue using this one though, because the spread /is/ very time consuming to make. Finally, I have my weekly spread! I use this style weekly spread on weeks where I don’t have a lot of hard deadlines but still have lots of things I need to get done. I have my appointments on the right side, and my to-do list on the left. And that’s it! I had a ton of fun making spreads that were in a different style (I’d used what I’d been using previously for over 2 years), and I’m looking forward to see how these spreads work out!